White tea comes from the same plant as green and black tea, the Camellia sinensis plant. White tea is made from the new, young buds and the very young leaves of the plant. Due to minimal processing, white tea retains more nutrients than green or black tea. The production process is probably why Pace University reported in a 2004 study that "the anti-viral and anti-bacterial effect of white tea is greater than that of green tea." 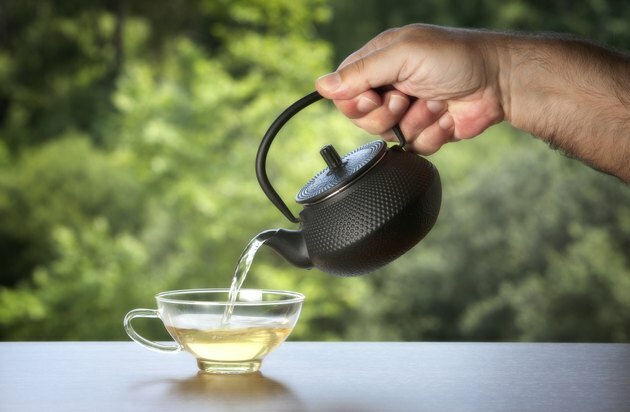 A separate study, conducted by German scientists, and published by BioMed Central Ltd, found evidence suggesting that white tea will burn away fat cells. Purchase tea from health food or specialty food stores, as they tend to sell mostly high quality teas. Choose loose leaf tea, so the tea leaf has room to expand and bring forth the best flavor. Look for fair trade teas, to not only ensure proper treatment of farmers, but to get superior and gourmet quality. Brew tea properly by using 1 tbsp. of leaves per cup of tea. Pour boiling water over the white tea leaves in a tea kettle, and let the tea steep for three to five minutes for maximum potency. Strain the tea into a teacup. Drink white tea plain to taste the delicate flavor. Do not add excessive milk and sugar, which will add fat and calories. Drink three cups of white tea every day for maximum benefit. Space tea drinking times out a few hours throughout the day. Try drinking one cup of white tea after every meal. Do not drink before bedtime, to avoid staying up all night, as white tea does contain caffeine. Follow a diet and fitness regimen to ensure maximum weight loss. Drink white tea to help burn fat, but remember there is no magic weight loss cure. Exercise three times a week, and include both strength training and cardio. Eat five or six small meals throughout the day. Drink eight glasses of water a day, and get a good night's sleep. Pace University: White Tea better than green tea?